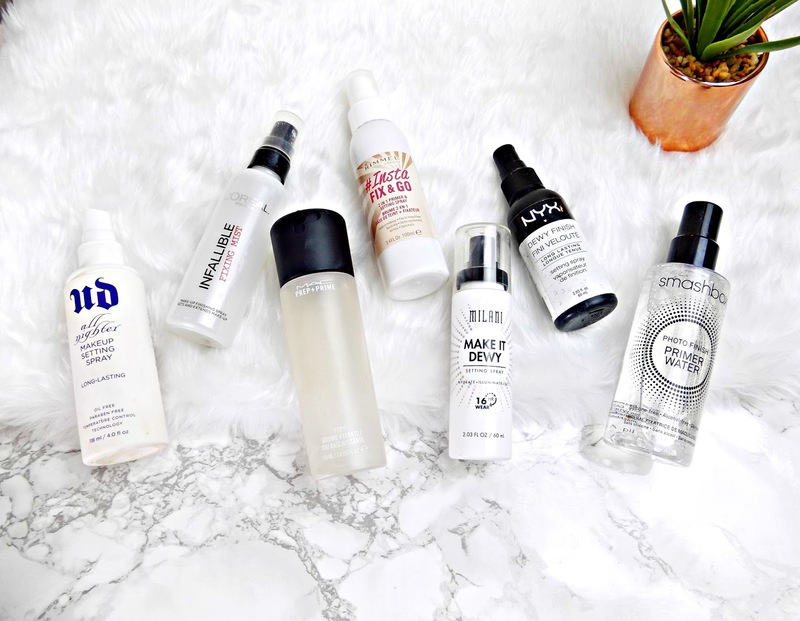 The beauty industry has gone setting spray crazy and so have I! I remember when MAC and Urban Decay where the only brands that did them, which aren't really accessible to everyone. But now most brands in the drugstore have one! I've tested quite a few over the years so I thought I'd put them together into one post. Urban Decay have just launched a whole new load of setting sprays, which I really want to try but I really don't need another setting spray! The All Nighter is probably the most famous one of the bunch, which claims to keep makeup looking fresh for 16 hours, without melting, fading or breaking down! The mist on this is perfect, it sprays a fine mist over the face. But does actually prolong makeup wear? I don't actually think this does but it does keep my makeup looking fresher for longer and stops my makeup from setting into fine lines. Now this isn't technically a setting spray, it's more of a finishing spray. It's packed with minerals to refresh the skin. It can also be used as a primer, but this isn't my favourite way of using it. The mist action of this is so nice, it doesn't like squirt the product out over your face. It really does finish my makeup nicely. I don't know how it does it but it makes everything look more blended, seemless and flawless! It also takes that powdery, cakey look away from the skin! It's great, one of my favourites! At the other end of the price we have L'oreal, with a fixing mist that promises to keep makeup in place all day. I found this very similar to the Urban Decay one - it keeps my makeup looking fresher. The only downside is the mist isn't as fine, it definitely spritzs water out. But if you're looking for a cheaper alternative this one is very good! Another affordable favourite of mine, this Milani option ticks all the boxes! It's hydrating and illuminating but also sets makeup. It also makes makeup look flawless in the same way Mac Fix+ does! I also find this keeps my makeup looking fresher for longer. It's like the Urban Decay and Mac one rolled into one! The mist is also super fine. It's brilliant. I highly recommend this one! This was my all time favourite for a long time and I've repurchased this. This is similar to the Milani one in terms of hydrating but I don't actually find this adds any extra 'dewyiness' to my makeup. But it keeps my makeup looking fresh and takes that powdery look away from the skin. The mist isn't the best but for the price this is a great setting spray! There's also a matte version for oilier skin types. This is a two in one setting and primer. It actually works quite well as primer; it adds that bit of extra hydration my skin needs. It works well as a setting spray as well. I find this super refreshing so I just like to spritz on throughout the day to perk my skin up a bit and refresh my makeup. It also smells really nice to. The mist action on this is ok, not the best but the worst! Overall, I really like this! Finally, I have the Smashbox Primer Water. Which can be used as primer, setting spray or as a refreshing mist to perk the skin up. I don't love this as a primer, it's ok. If you struggle with primers I think this would be a good alternative but for me it doesn't do a lot to my skin - I find regular primers work way better for me. As a setting spray it's ok, I didn't find it done a lot to makeup. The best way I've found to use this is a refreshing mist. But at £20 I don't really think this is worth the money. Taking everything into account (price and performance) the Milani one is my favourite, it does it all and has a really fine mist! But if you're looking to spend a bit of money then Fix+ is the all round winner. Have you tried any of these? What's your favourite setting spray?